On June 25, 1940, the world was witnessing Nazi Germany marching through the Low Countries of Europe and France; Britain was about to feel the onslaught of German airpower with its bombs falling on London, and even on Belfast in occupied Northern Ireland; the effects of the Great Worldwide Depression would start to ease up on the world economy; and Franklin D. Roosevelt was seeking a third, unprecedented term of office as President of the United States, still a neutral world power. On that same day, June 25, 1940, Division 15 would be granted its charter as a Division of the Ancient Order of Hibernians by its National Board. 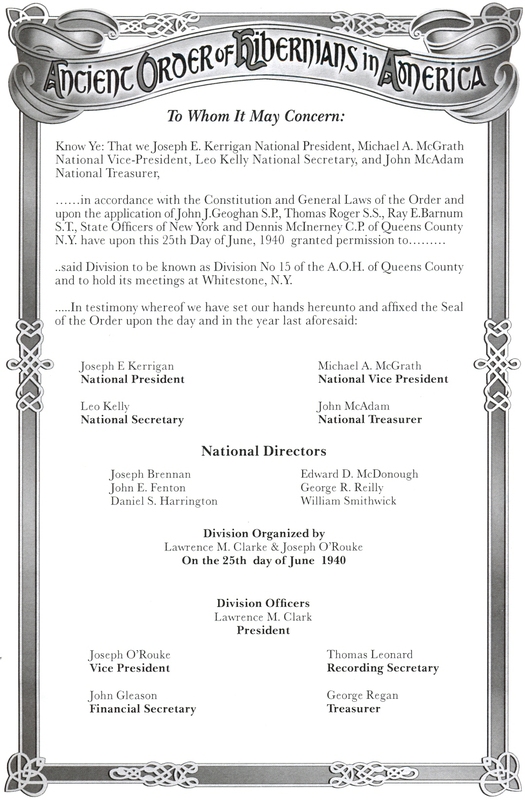 Two of its charter members, Lawrence Clarke and John Gleason would lead long productive lives, and continued to be active in the Division. John Gleason was the owner of a funeral home in the village of Whitestone which is where the Division likely held its meetings. In the mid-1970s, the Division was revivified under the leadership of Joe Ryan who owned a bar in Whitestone called the Parkway Inn on the service road of the Cross Island Parkway. The meetings were held there for awhile. From that location, the meetings were shifted to the Odd Fellows Hall on 14th Avenue in Whitestone village. And, later Division 15 met in St. Mel’s, in Flushing, in the 1990s. Coinciding with the struggle for human rights against the oppression of Orange sectarians and British occupying forces in the North of Ireland, Division 15 experienced a spurt in growth. Many members picketed outside the British embassy during the period of the Hunger Strikes in 1981. At the suggestion of Pres. Matt Feeley Sr., the Division was named the “Fiona of Erin” Division. In 1990, the Division celebrated its 50th anniversary with a dance in St. Mel’s. While the Ladies of Division 15 started holding their Cultural Day every first Sunday in March, in the St. Mel’s lunchroom, the men of Division 15 participated in setting-up and having a recruitment table. The Division helped venerate with Queens County A.O.H. the memory of the Great Hunger at an official ceremony and presentation in 1997. This was spearheaded by Pres. Larry Sullivan who was also noted for organizing bus trips. During the 1990s, Pres. Mike Kearney and Pres. Bridget Kearney ran ceremonies in Fort Schuyler to commemorate Cmdre. John Barry, “the Father of the American Navy.” They became instrumental in organizing the effort to recognize Barry as the “First Senior Flag Officer,” signed into law by President Bush in 2005. The history of Division 15 is reflected in the vision and hard work of individual Hibernians. The men of Division 15 deeply appreciate the work of the Ladies of Division 15 L.A.O.H. and the good times the men shared with them.